Can you imagine getting tired of looking at sharks when you are swimming with three of them? That's what happened on our trip to the Exumas in The Bahamas last November! We got some spectacular photos of those sharks, but after about 20 minutes we were ready for something else. And there was plenty else at which to look, as you can see by this picture. This picture shows an adult Queen Triggerfish swimming among a school of Yellowtail Snappers just above the corals at about 50 feet underwater. 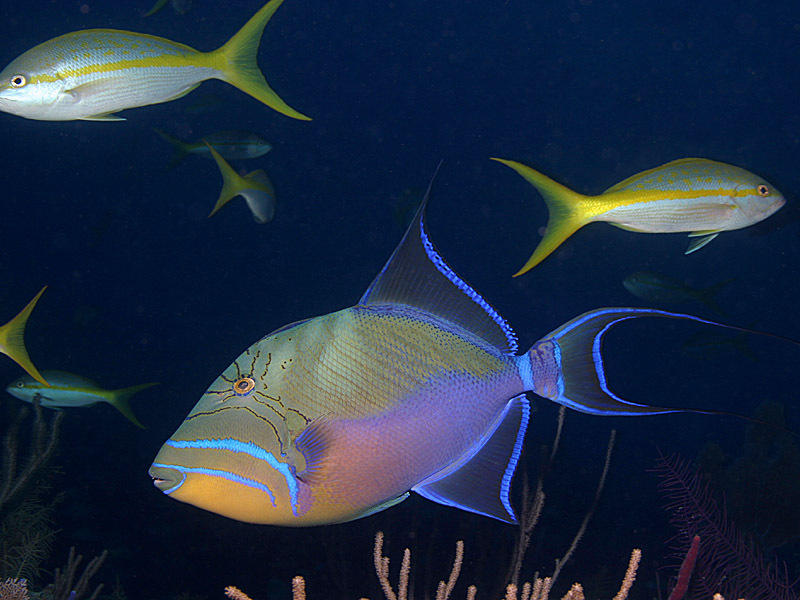 The Queen Triggerfish is a bright-colored predator that eats a variety of marine creatures including invertebrates such as snails and urchins. The Queen Triggerfish is built for speed, and it regularly cruises above and between the corals of the reef as it searches for food. It is able to eat creatures such as snails and urchins because it has a mouth full of teeth that can crack the shells of such creatures. ReefNews President Jonathan Dowell took this picture using a Canon 10D digital camera with a Sigma 18-50 mm zoom lens in an Ikelite housing with an Ikelite strobe. Camera settings were f/8 at 1/60 and 43mm zoom. This picture was taken about an hour before sunset, at 4:57pm Exumas local time. Copyright © 2005, 2006, ReefNews, Inc.